I haven’t posted my ‘found favourites’ for a while so I thought I would. From top left to right: Gorgeous ‘Bunny Ring’ by Dillondesigns; ‘Bird in the Grass’ original print by Amy Schimler from Redfishcircle; ’10 large antique watch crystals’ that I think are beautiful (although I have no use for them, I want them) by BigdaddyO; Original silkscreen print called ‘Gentleman caller‘ by estasketch; Cute little hand sewn shoes made from recycled cheetos packages, covered in vinyl and lined with felt by MoJoTrashion; and a decorative teapot called ‘Silver Winged Dragon’ by Lar2000. 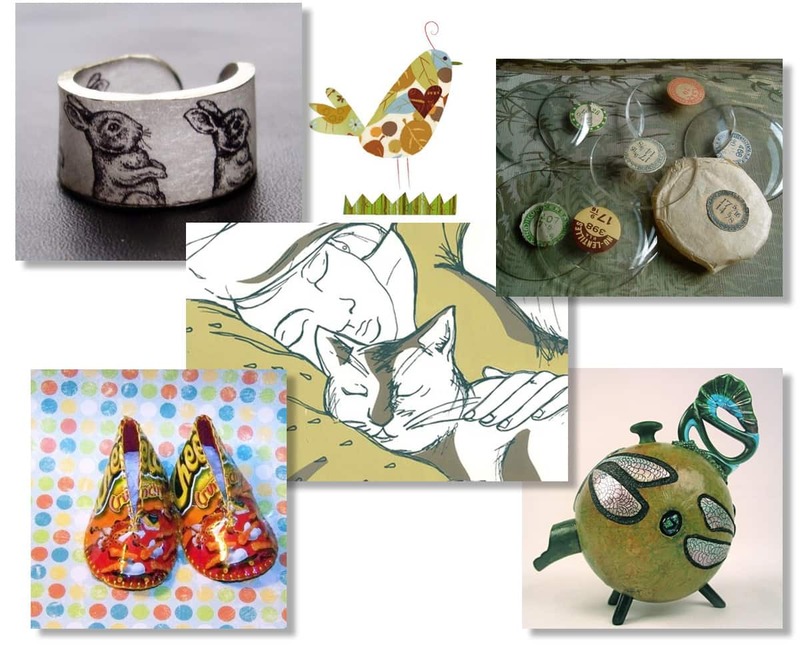 This entry was posted in Blog and tagged antique watch crystals, bird in the grass, bunny ring, Cat, Etsy favourites, hand sewn shoes, original silkscreen print, recycled cheetos packets.